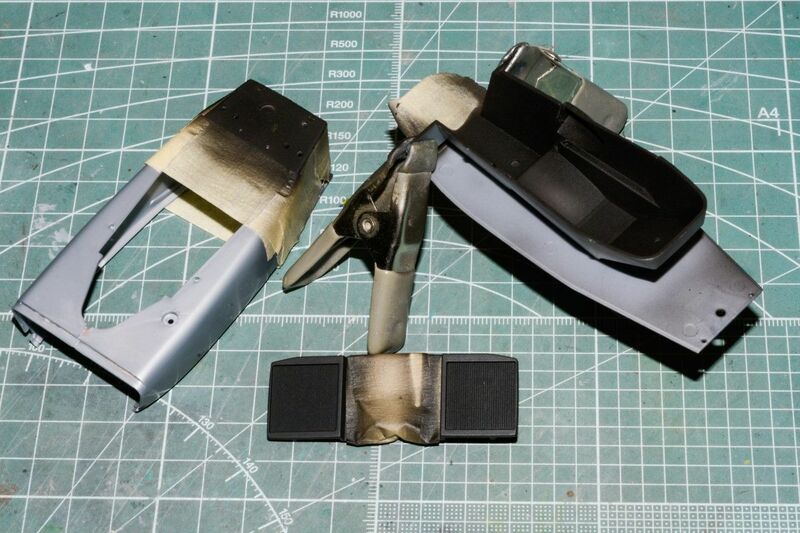 For Formula 1 racing modelers. Just thought I formally post my current build, which is now the Ebbro 1/20 scale Lotus Type 72E 1973 car of Emmo Fittipaldi at the Spainish F1GP, which he also won. Just gotta love Emmo. 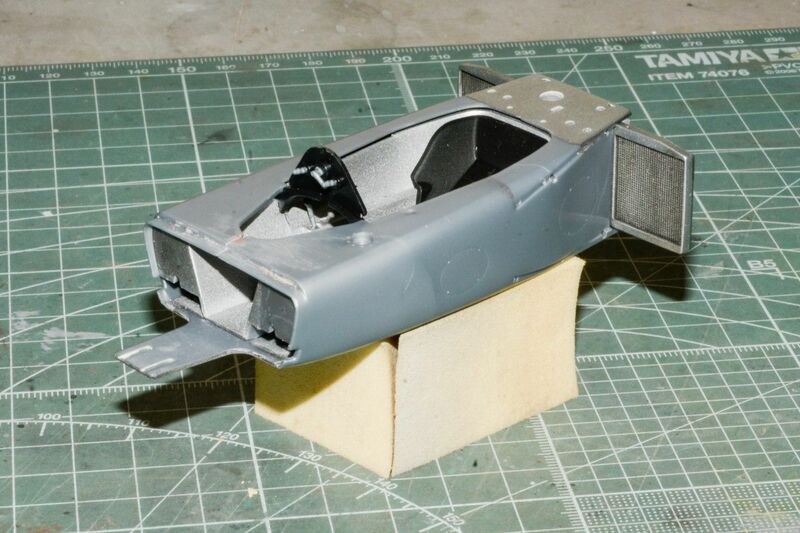 I've just started workin gon the cockpit and the body sub assemblies. Hope to have my 1st update sometime this comming week. And yes I know that I had posted that I was going to build the Lotus 49 DVF, but decided to just hold up on it for now. You got me following along Joel, great Lotus F1 fan and this is in the stash with colour matched JPS black paint replacement carb mesh grills and a resin figure of the man himself. Just getting some tubing for the cables and pipes/hoses and clearing a couple of builds from the bench although thanks to Gabriel there is a m/c next up, something I’ve never built. Joel, my other modeling love is open wheel racers, and I have quite a few unbuilt kits in my collection, so I'll be following your build with interest. However, I believe this Ebbro Lotus is actually 1/20th scale, not 1/24th. I purchased the Tamiya 1/20 scale Lotus and thier Honda F1 nearly 20 years ago. When the Ebro line came along, I purchased several of thier kits as well, until one day I realized they weren't 1/24th scale. Although these Ebbro kits are absolutely beautiful, I already had at least 8 open wheel racers In 1/24th and 1/25th Scale in my collection and the size is significantly different when displayed together. 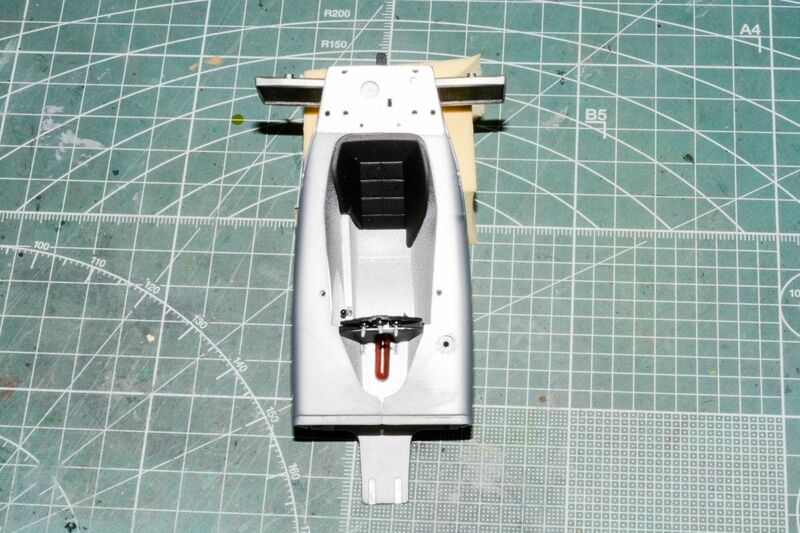 I wish more manufacturers would market some classic open wheel racers in 1/24th scale. The Lemay museum not far from where I live, has a Lotus 49 on display. When you get to the '49, I can send you a couple of photos. You're completely right about the wrong scale. it's not a typo issue but a mental screw up from all the times I kept on referring to the Fujimi 917K which is in 1/24 scale. I've corrected my signature, and the post, but I have absolutely no idea of how to correct the thread title as I've never found any access to it. Like you, my small but growing stash of cars has 1/25 scale (AMT Indy cars), 1/24 scale, 1/20 scale, and soon even a few 1/12 scale race cars. For some reason Tamiya decided years ago to on both 1/12 and 1/20 scale rather then 1/24 scale which makes no real sense. But so be it. But none F1 cars are in 1/24 scale which just makes it even more puzzling. As for the Ebbro brand, It's head is a former Tamiya car guy, and the company is not only funded by Tamiya, but I now believe that Tamiya owns part or all of it. Certainly, they have access to much of the Tamiya "empire", which explains their high quality standards. I'm really thrilled to see that you've got a nice stash of cars, and hopefully will start to post your builds here. One of my goals is to help grow AutoModeler by getting others involved who like cars as well as aircraft. And speaking of aircraft, I have no intention of giving them up, just will be at least for now building 2 cars then 1 aircraft, but for all that know me, that's subject to change at a moments notice. Now that's great news. Love to have you start building and posting here on AutoModeler. Never can have enough race car guys. I've found that getting a lot of the wiring and hoses for the various scales to be almost impossible. HLJ carries Hiro Boy hollow hoses in various sizes as well as multiple colored wires. it's not cheap, and the shipping is somewhat high, but I placed an order with them. It's shipping this week, so hopefully I'll have it the latest by mid Sept. Now for the really good news. I ran into a car guy who told me about fly line leaders. 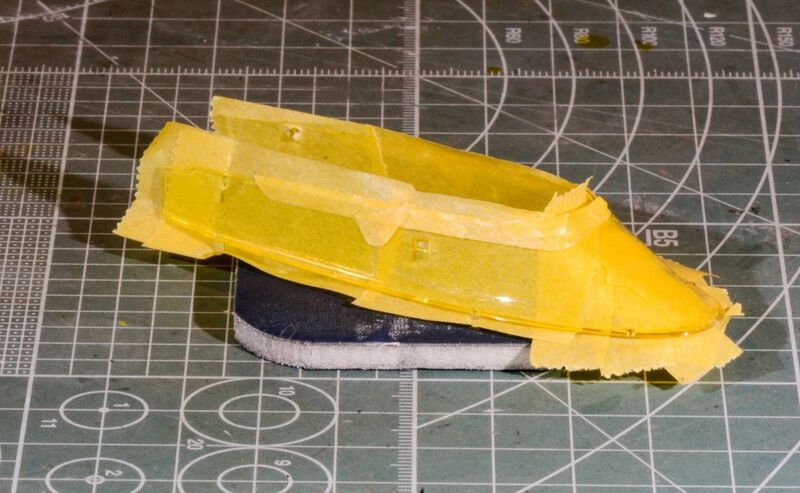 They come in various colors including clear, and in sizes to replicate scales from 1/25-1/12 scale. I'm lucky that I have a Dicks (Sporting big box chain) 2 miles from me, and they actually had in stock the leader material. What's more the leaders packages are cheap. That's good to know Joel, I don't know of any fishing tackle shops around me as it's not something I'm into but I know a few people at work who are so I'll ask them when I next see them. I'm fairly lucky in that Hiroboy are based in the UK so Zero colour matched car paints are only an order away, did you know that there is about 20 different shades of red for Ferrari's! 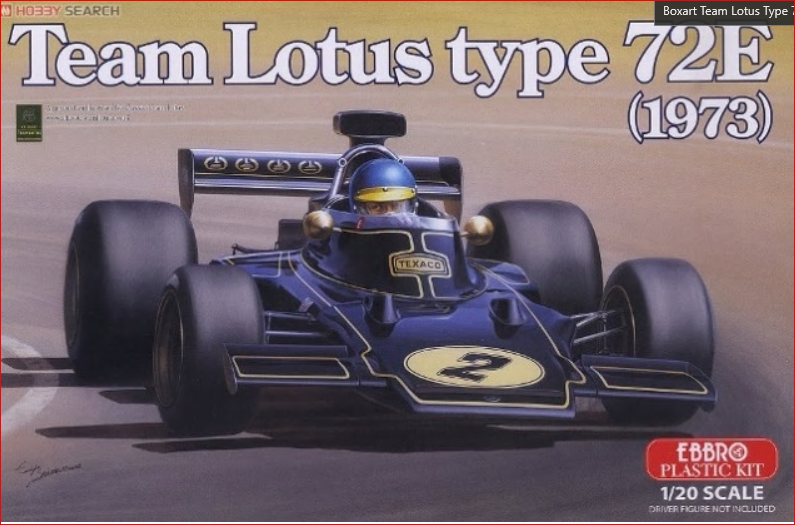 As for 1/20 scale Fujimi and Hasegawa both joined Tamiya in producing F1 cars in that scale and both released a few Lotus (Lotuses, Lotus, Lotus's, Lotusi???) 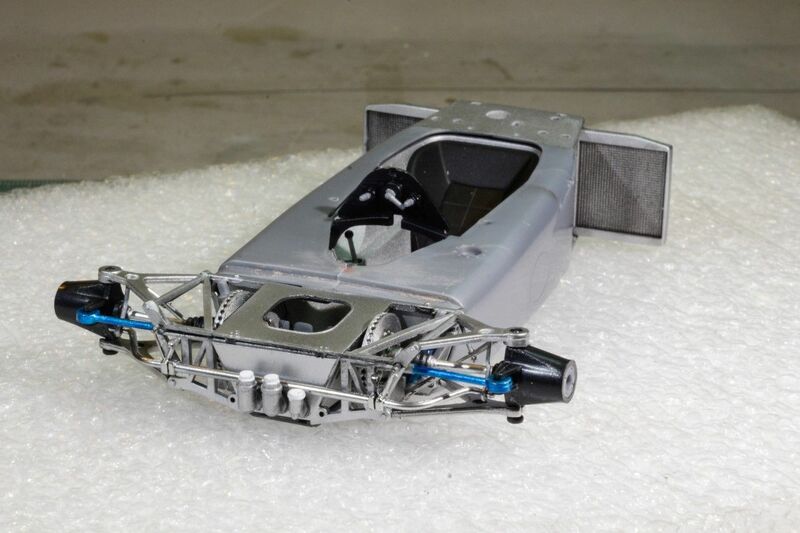 however Revell Germany have released a few modern F1 cars in 1/24 (Red Bull, Mclaren). I'm building a car at the moment however it's a secret club build and I know that a few club members frequent the site so I can't say any more. Once the club reveal has taken place in November I'll post up a picture or two. Looking forward to your build Joel! Does the Ebbro kit actually come with the JPS decals? Or would you have to get ones from Studio27? Joel I'm in! I love the classy livery of this car, most elegant in its simplicity. Sorry for tuning in late, I was completely devastated by what is going on in my home country and incommunicado. Hiro Boy also carries various sizes of the hollow clear tubing. I've got them coming from Japan as a backup just in case I couldn't find the right leader material, that of course I did after I ordered it. I'm pretty sure it's Lotuses, at least on my side of the pond. Ferrari's variation of Blood Reds is just mind boggling. I'm guessing that over the years they've changed paint suppliers or the pigments were changed some, and that's the reason for the variations. Looking forward to seeing your build when you feel it's safe to post it. So glad to have you along for the ride. I can assure you it's going to be rather interesting to sat the least. Glad to have another friend along for this journey for sure. The kit decals aren't don't contain any Tobacco nor Alcohol advertising, so no JPS logos. fortunately, I've purchased the full set of decals from Indy Cals that contain all the JPS decals needed. These decals were printed when he was using the Alps system, so I'm in new territory with them as well. Any issues and I'll just order a new set as he now uses a laser printer, and those decals are spectacular to say the least. It's a real shame that the Cartograf decals just don't meet our expectations. I assuming that you're referring to all the violence and political unrest currently going on in Romania. I wish that there was a non-violent means to reach a working and accord there. My Mother's parents were from Romania, so in a strange sense, I have ties to your country as well. Follow along when you can, but there are so many more important things going on in your life right now. Regarding the Ferrari F1 cars the red's went through gloss, metallic, mica, pearl and candy finishes however most models just say gloss, you need to know the year and what paint was used. Regarding the JPS and other cigarette (and alcohol) decals the reason for them not being included is due to the ban on cigarette advertising which also includes model kits, all I can say is thankfully the AM decal market has us mostly covered. Agreed, I wonder if Studio27 has released any decals for this application. Looking forward to seeing your build! Thanks for the clarification. For what it's worth, I'm not a big Ferrari fan in any series that they've run in since the 60s. Ford, Lotus, McLaren, & Porsche are the Manufactures I usually follow, which covers most the road racing series till present day. My main overall interest is Indy Car racing, but it's all resin kits, and I still don't have the skills to build one. At $125 per kit, they're not exactly learning tools, but I'm getting there. I certainly can see me building some Ferrari cars, but not many. I do have the 330 P4 that fought it out with the Fords. As for the proper color, I'll certainly reach out to you when the time comes. Most of the model car paint companies make a few to a good half dozen Ferrari Reds, so close might be good enough. Totally understand, I only started to follow Ferrari once Lotus dropped out of F1, must be the Italian in me. Indy car unfortunatly we get very little coverage over here so I don't follow, NASCAR we get the odd race which I do sometimes watch but not knowing the teams or drivers I just pick a car I like the livery of and follow that for the race. Other than that I follow Aussie V8 Supercars, great series but no model kits and the GT series when I get a chance to see it, got a few GT1 and 3 cars in the stash mainly Mercedes. Also like the old FIAT and Lancia rally cars. Well, finally it's time for my 1st update. 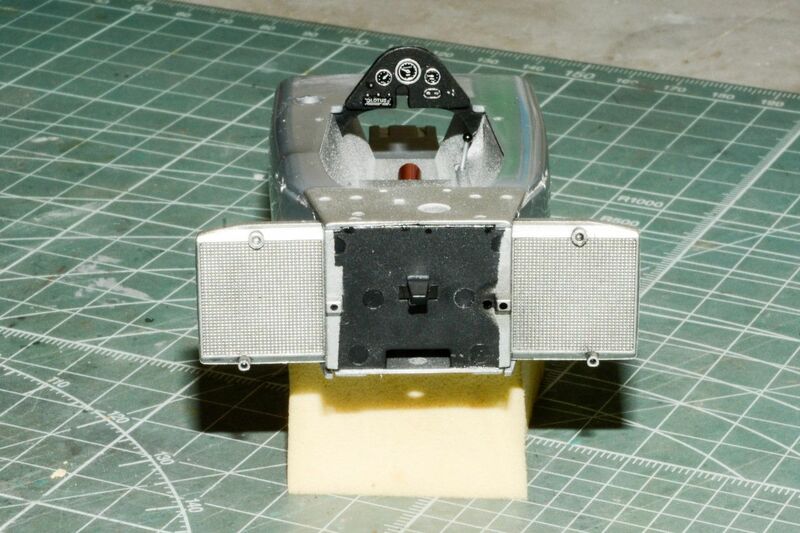 Just like with aircraft, I like to start my builds with the drivers tub even though it starts as step #3. Ebbro has molded all the parts in either Black or a Metallic Gray that does look pretty good, and nice match for Flat Aluminum. This will come in handy for some small parts that are buried deep in the suspension or engine/transmission, where they will be almost to completely be unseen. 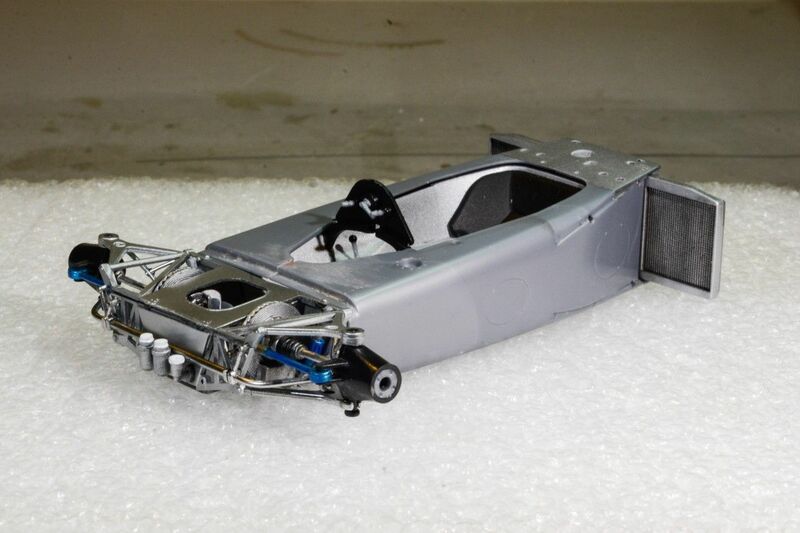 The chassis consists of the bottom plate of the monocoque frame with the tub. The tub is basically one piece with an insert for the shift level and spacing for the drivers hand so he can go through the gears. The fit isn't up to my standards, so some sanding, putty, more sanding, and polishing took care of those issues. I then glued it to the bottom plate. 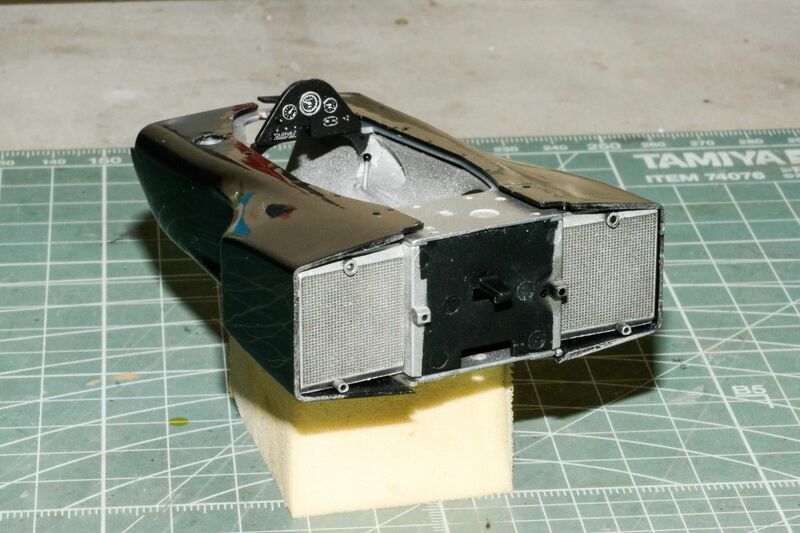 The sides of the tub were glued up, then both were masked for Black primer, then Alcad CL#101 Flat Aluminum. I also masked the two side radiators, and painted them at the same time. 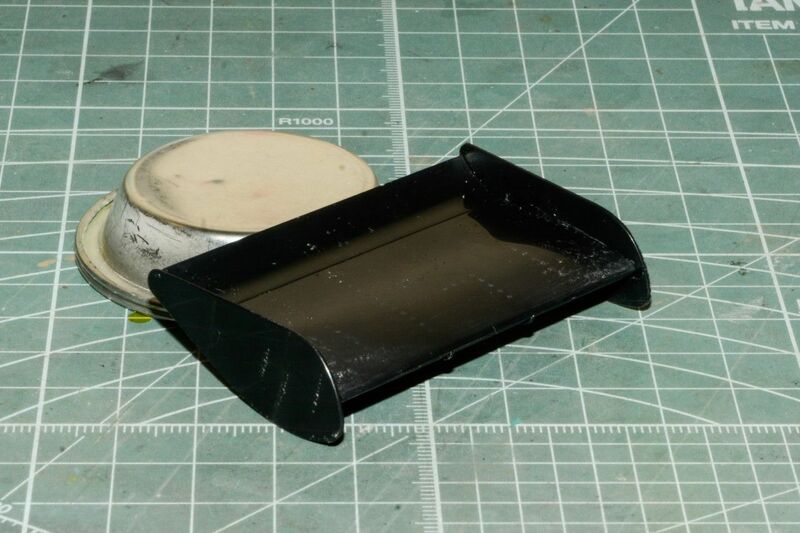 The simple IP was painted Tamiya Nato Black. Using the kit instrument decals and a liberal dose of Pledge, the IP was finished and installed. The shift level Knob was painted gloss Black, and installed. Finally, I glued the sides to the tub and bottom plate. 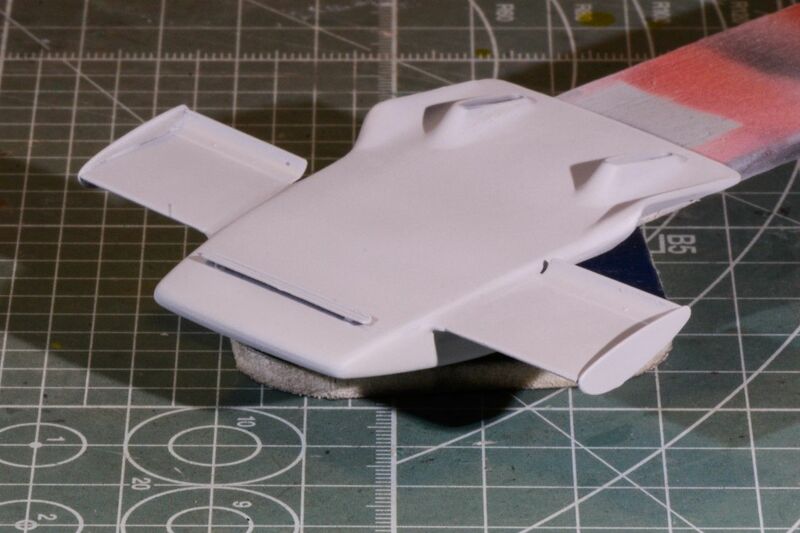 Next I built up the side pods and dry fitted them. The fit is perfect, as you can easily see how they cover most of the outer tub, so I didn't bother painting it except for the top rear section. 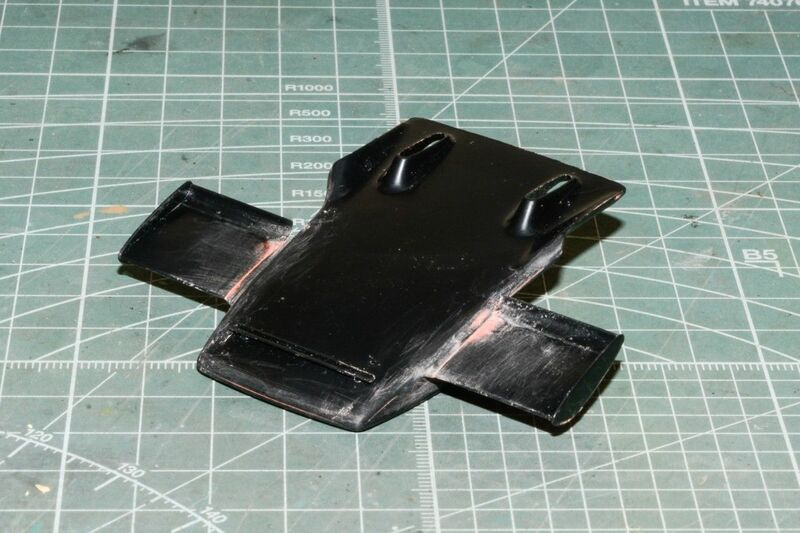 I built up the nose sub assembly with the front wing, and the a little sanding and putty work was needed. 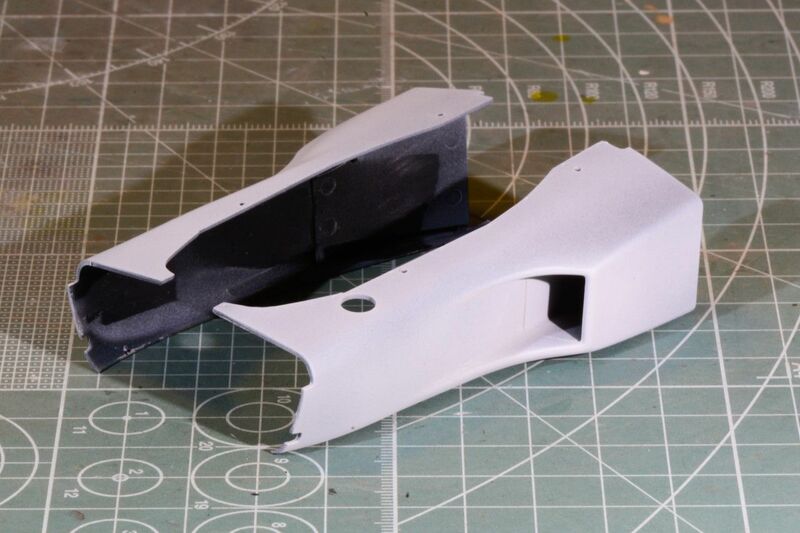 And finally the massive rear one piece wing was assembled. As always, thanks for stopping by and checking out my build to date. it's much appreciated. thanks for the thumbs up. So far the kit is really a great build. Well, it's time for my next build update. 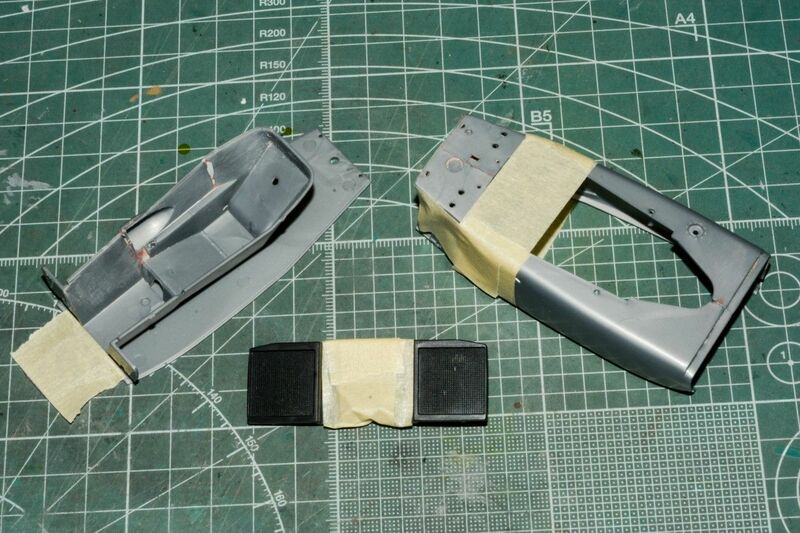 My focus continued on getting the various body and wing assemblies ready for primining. Once I reached that stage, I primed them using Tamiya Gray lacquer Surface Primer thinned 1:1 with their Yellow Cap lacquer Thinner, & air brushed @ a flow rate of 20 psi. 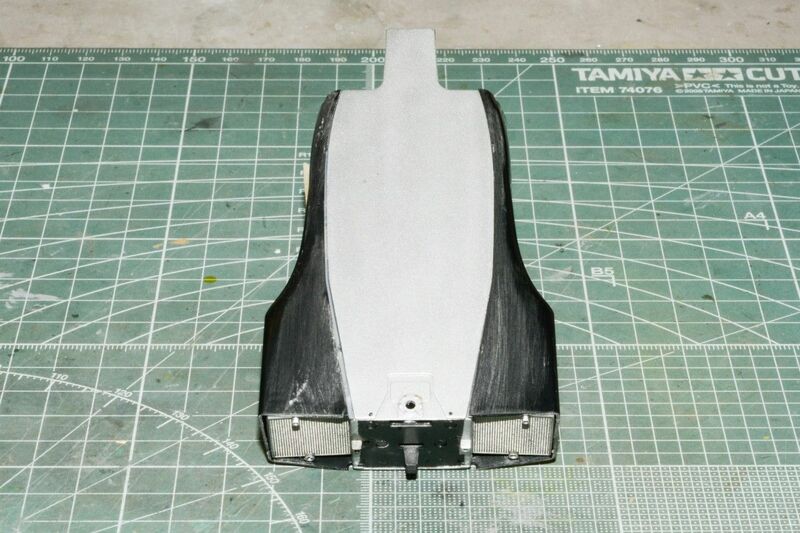 After a few hours I very lightly polished out all the surfaces with a piece of Tamiya 3,000 sanding sponge. 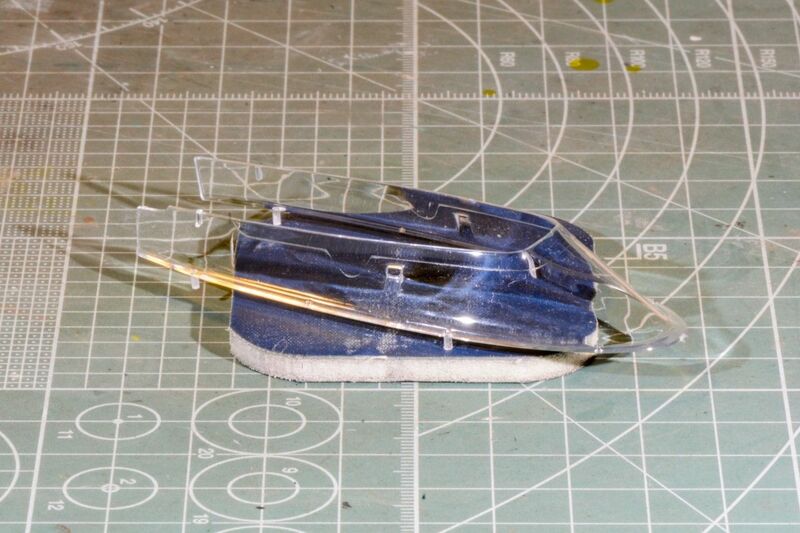 the Nose clip wings really needed more work, then repriming and polishing. Looks pretty good now. I must have missed it, but in the picture of the wing, I can see a small section of the far side plate seam that needs a little more filler. 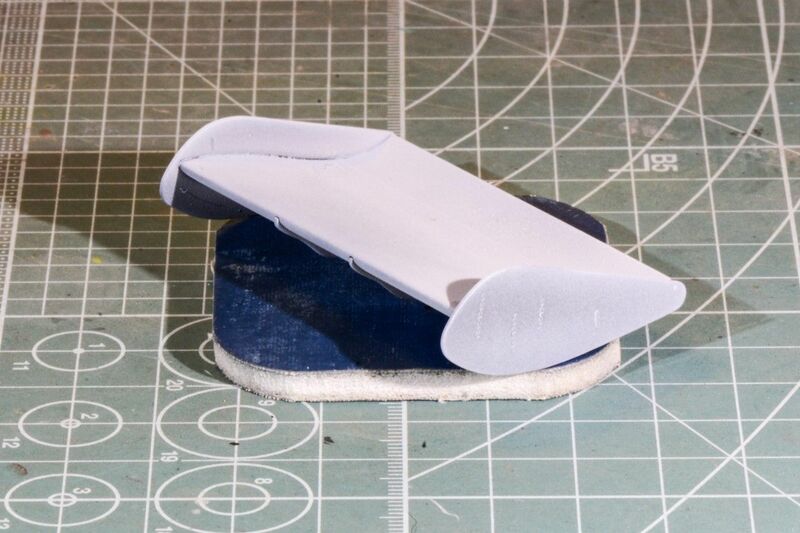 I'll go with Vallejo Acrylic White Putty just to shallow up, & even out the seam. 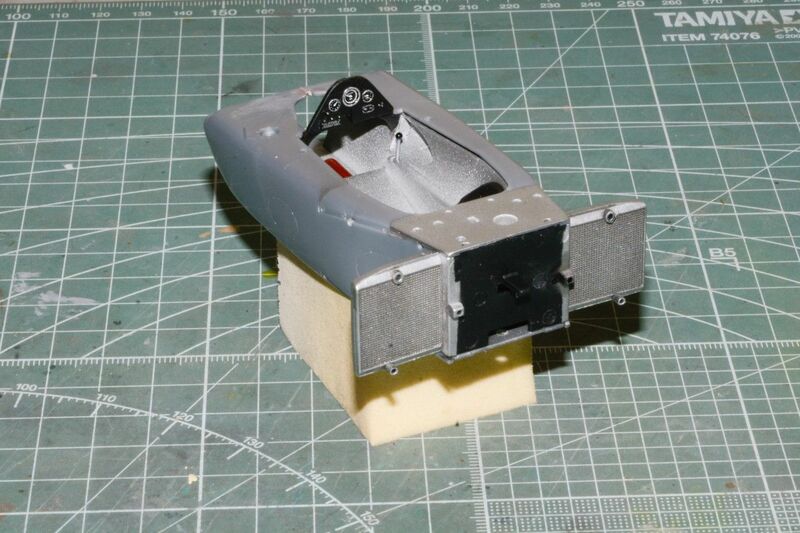 Next up was the front suspension and steering box, which turned out to be a model all by itself. 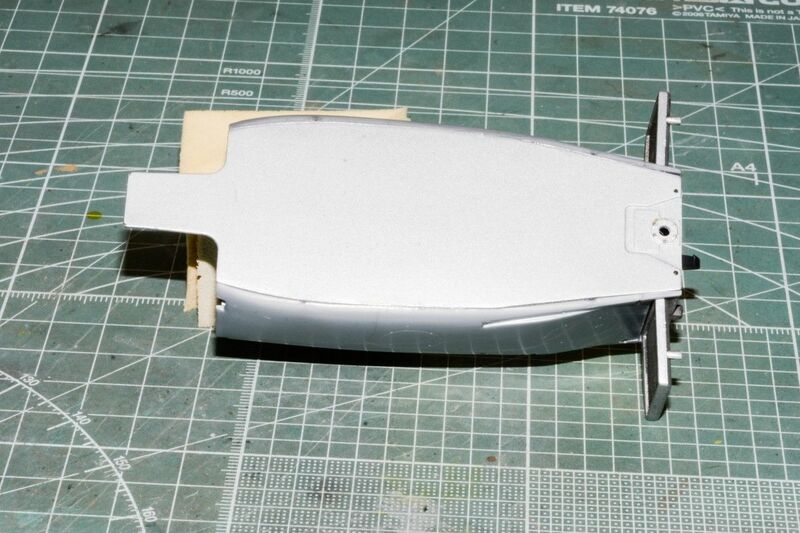 I started off with the brake discs which are mounted inboard rather then stuffed into the back of the wheels. What concerned me was that the surface that the discs mount to are angled down & inward. My conern was that the steering half shafts wouldn't fit at the correct angles. So my plan was to enlarge the mounting holes for the shafts to give them a little alignment play. I then dry fitted them to see how much I needed to enlarge those holes. Well, the Ebbro engineers already addressed this issue by having the outer steering half shafts ends as a tapered cone fitting into a female cone with a little play. Everything aligned perfectly. I air brushed the Aluminum sheet parts Alcad #101 Flat Aluminum, and all the polished steel rods #107 Chrome. The outer sections of the steering tie rods are a sort of Metallic Blue, which I air brushed Tamiya Clear blue over the Chrome. I brush painted the caps for the 3 brake fluid canisters an off white. One everything dried, I dry fitted the front clip. Finally, I finished up the week with masking the huge combination cowl and clear plexi which is one piece. That's really a nice touch as there is no chance of screwing up trying to glue it in place. 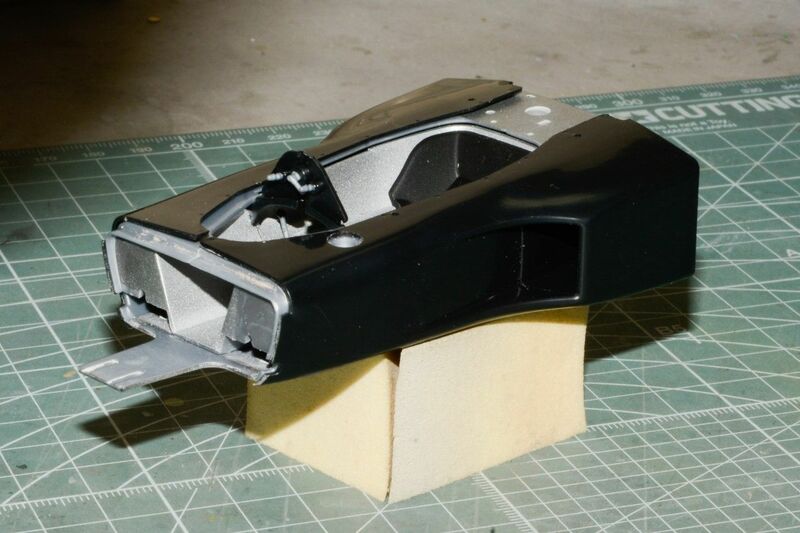 As always, thanks for taking the time to checkout my progress on the Lotus 72E build. It's always much appreciated. Joel this is looking great! That one piece plexi is gonna look amazing! Those designers sure did come up with some funky looking shapes! I'm not familiar with Ebbro, but seems like you're having serious fun there! It is so nice when the engineering skills meet modeler's skills! That massive clear part solution I have seen it to other manufacturers as well, inclusive Eduard, Tamiya and, recently, Heller. With careful masking is the way to go! Nice work so far! Keep going! Can't wait to see the finished product. Wow, Joel. Nice detail in the front end! I have just caught up on this build. Beautiful progress on the Lotus. I have to say it was their colour scheme that got me into F1 when I was a teenager, about the time Mario Andretti starting driving for them. Didn't convince me to try the product though! I do have this car and relatives the 49 & 78 from Tamiya in 1/12th. I couldn't help myself as they re-released them over the past few years.